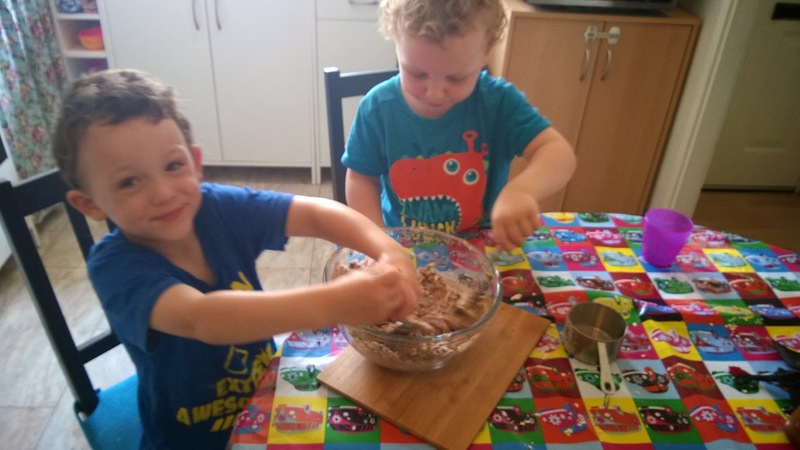 I love trying new things with the kids and experimenting with recipes for healthier treats since I feel that processed foods and high levels of sugar are especially unhelpful to our health. Our local store has just started stocking cacao powder and cacao nibs so it seemed a good opportunity to do some baking. 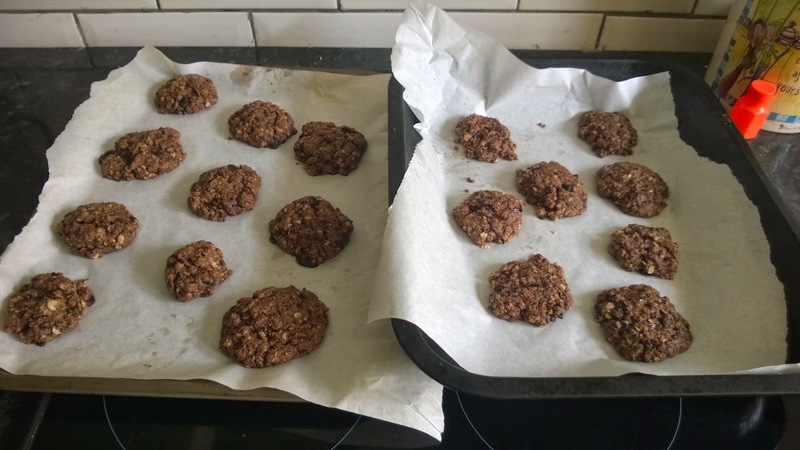 I found a recipe for cacao nib cookies (click here for link to original recipe) and adapted it to use wholemeal flour instead of plain, molasses instead of brown sugar, and added in some cacao powder to make the cookies even more chocolaty. Mix it all together - it will be quite a crumbly mix but you should be able to squash a spoonful into a ball without it falling to pieces. If it's too crumbly add a tablespoon of water or milk and try again. Roll dessertspoonfuls of the mixture into balls, then flatten to make cookie shapes. Place on baking paper on baking trays, leaving space between for spreading. Bake for 8-10 minutes - the edges should be starting to feel firm, but the middle should still be a bit soft. They will harden up a bit more as they cool and dry outside the oven. (I used to make the mistake of leaving biscuits cooking until they felt dry, but then they end up so hard when they cool that you can't bite them). We ended up with 18 cookies, but would have had more from the mixture if it hadn't been taste tested quite so often by the boys as they were making it. The results in terms of taste are of mixed success in our house - Ollie and I love them, Toby is less enthusiastic and Matt really doesn't like them. The cacao nibs are crunchy, nutty and a little bitter which I really like against the treacly taste of the molasses, but Matt is a choc chip 'Chips Ahoy' cookie fanatic and didn't like either the nibs or the molasses. Health wise they do still contain sugar, but the molasses are an unrefined form packed with nutrients not found in refined sugar, including iron. Cacao powder and nibs are nutritionally extremely beneficial according to the hype with a range of nutrients and antioxidants. Wholemeal flour and oats are good nutritious ingredients that will release energy slowly and along with the egg are a source of protein. So while still a treat, these cookies shouldn't give you a sugar high and subsequent crash the way regular biscuits do. An interesting theory I read recently about sugar said that it depletes our bodies of zinc, and zinc is necessary for us to develop an 'adult' taste palate. By eating foods high in sugar and feeding them to our kids we essential retard our preferences at the level of a young child, and conversely by avoiding excessive sugar we can change our preferences towards a more savoury palate. So if you have trouble getting your kids (or yourself) to enjoy anything other than processed foods, a good place to start would be in cutting right down on sugar and sweeteners.